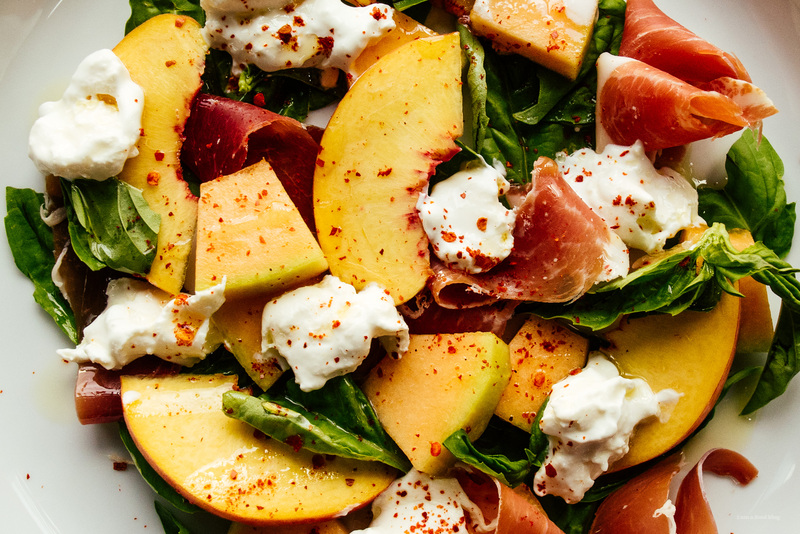 A summer salad full of Colorado's sweetest fruits: melons and peaches! We’re in Colorado! Well, wait, we’re not exactly in Colorado anymore, but we were and I made a stunning peach, cantaloupe, basil, and burrata salad. Before this trip I knew nothing about Colorado, except that it’s kind of sort of in the middle of the US. But, as I learned, and as Mike told me, Colorado is a big deal. 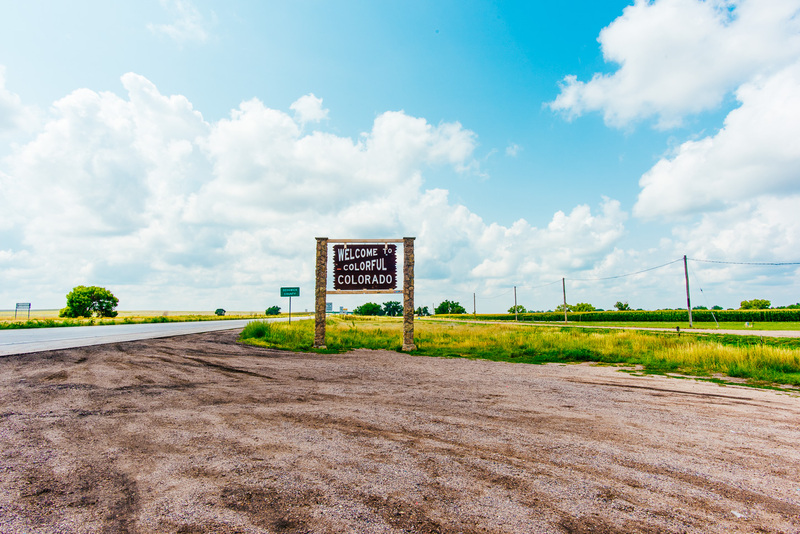 They’re known for mountains (and all the mountain sports that go with), craft beer, the invention of the cheeseburger (disputed), legalized weed, green chili, lamb, and most importantly, fruits and veggies! I had no idea that Colorado, which means colored red, grew so many fruits and veggies. 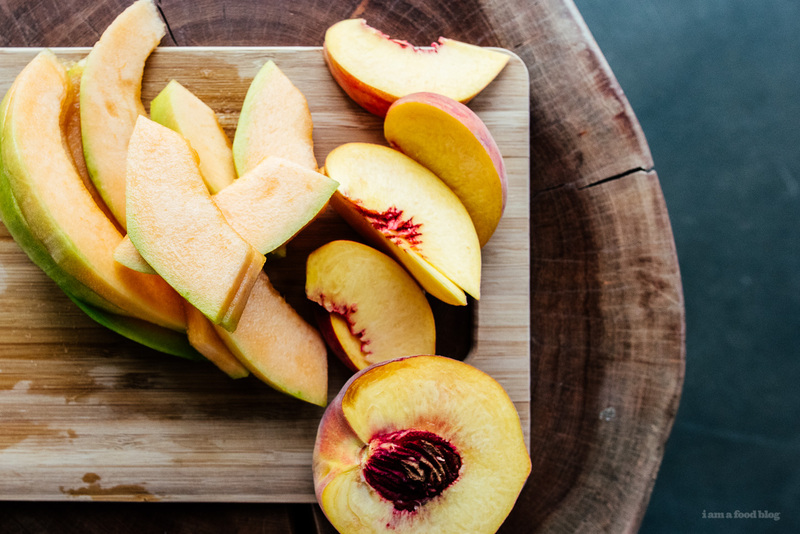 They essentially grow everything, but they’re most known for Palisade peaches and Rocky Ford melons. Naturally, Mike and I stopped to pick some up. Mike really wanted to get some pueblo green chilies too, but they weren’t in season. He also said I should get some corn, but I wasn’t feeling it. Now, I’m kind of kicking myself over it though because apparently they’re known for the sweet corn from Olathe. I missed out on the corn, but at least I didn’t miss out on the peaches and melons. The peaches were intensely peach-ful and the melon was some of the best I’ve ever had. I somehow managed to eat a whole melon one night, after a full dinner that included this salad, which was so much fun to make. I was really excited because after spending so many nights alternating between camping and staying in hotels, we finally stayed in a place with a kitchen. And what a cute place it was! 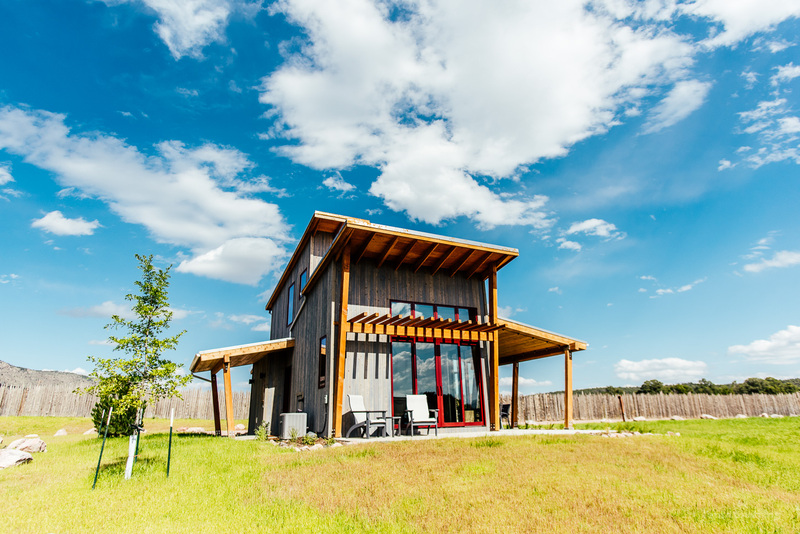 Originally we intended to go camping in Colorado (we did end up camping in Colorado National Monument, but that’s a story for another day), but as I was searching for campsites, a cute little cabin/glamping situation popped up. Luckily they happened to be right near where we wanted to be. We fell in love, both with the Cozy Cabin and with Colorado. Right after we finished our salad, a storm blew in and we were treated to hail, torrential downpour, sun, and a rainbow all within five minutes. It was kind of magic. 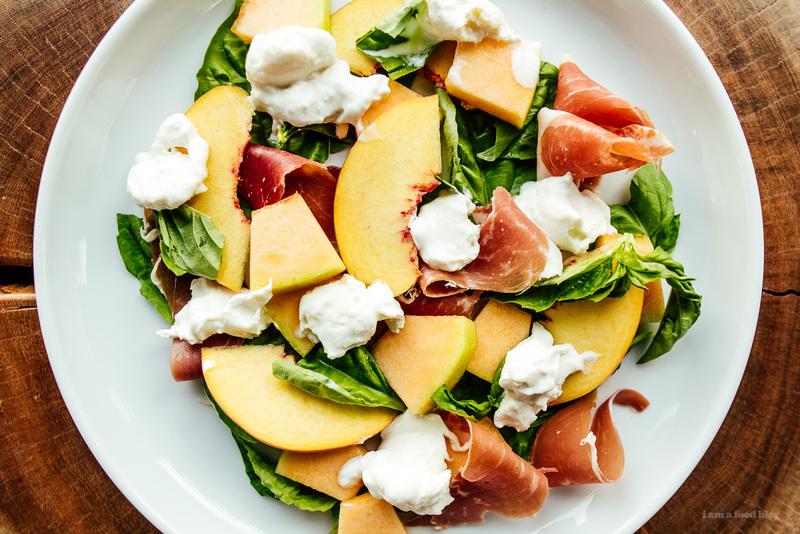 The other magic was this salad: perfectly ripe slices of melon and peach, fresh basil, creamy burrata, thin slices of serrano ham, a generous drizzle of olive oil, crushed red pepper, sunflower seeds, and sesame. We had it as an appetizer, but I could defintely see it working as a main, especially with hot toasted bread. So summery and so, so good. I hope you make it and imagine the majestic mountains and blue, blue sky of Colorado as you eat it! Note: I used Sichuan chili powder, which is why it’s so vibrantly red, but regular crushed chili flakes will work as well! 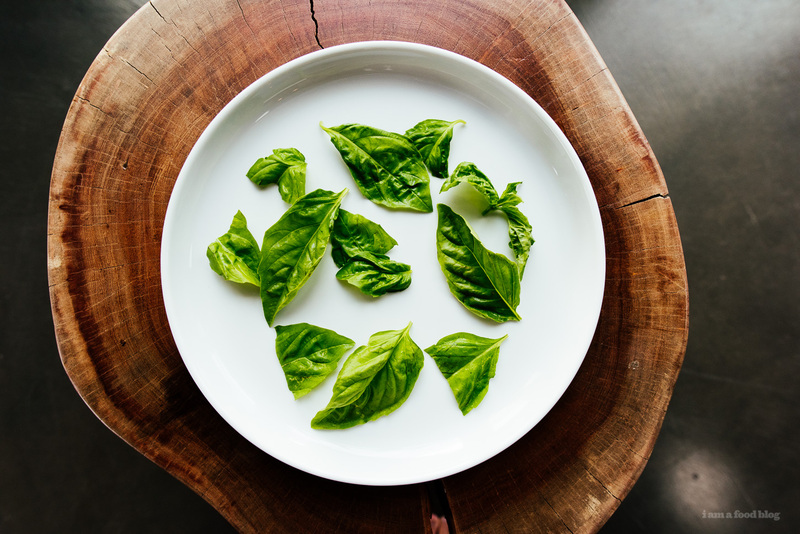 On a large plate, scatter the peach, cantaloupe, and basil leaves. Tear the burrata into bite sized pieces and nestle them in between the fruit. Tear the serrano ham and evenly place on the plate. Drizzle on the olive oil, then sprinkle on the seeds, red chili, and season with salt and freshly ground pepper. Enjoy immediately!